Disabled Motorcycle & trike Riders Aids & adaptions. Where a disability need not be a handicap! The largest range of unique Motorcycle Riders Aids & Adaptations. Products for disabled motorcycle riders / & trikers. Perhaps it was an accident, arthritis, or a replacement hip etc that made you stop or not consider riding at all. Well here is the good news, you may need to buy another motorcycle, Please scroll down & read on !! The Bike Experience – helping disabled motorcyclists ride again, more details on our “links” page. Disabled Motorcycle Riders Aids and Adaptations is a website created for bikers & trike riders with a range of disabilities, you can virtually have a clutchless motorcycle, we manufacture aids & adaptations many unique to us & not available elsewhere, we want to share our passion for riding motorcycles & trikes and to help disabled motorcycle riders continue that enthusiasm, maybe for the first time or to help get you back onto a 2 or 3 wheel motorcycle & regain your independence. We design and manufacture all of the products available on this site in the UK they are not cheap relabeled imports manufactured in the far east, we have many useful & unique adaptions designed for injured, disabled & amputee, motorcyclists & trikers. For leg amputations – We have an extremely effective reliable button-operated electric gear shifting system,( Flatshifter Max) just press the green button to change up through the gears press the red button to shift down, alternatively the Dualever twin lever system, can be set up to operate with 1 hand the clutch & front brakes or the front and rear brakes. For arm amputations – Again our Dualever/ k-lever system can be mounted on the left or right-hand side of the handlebars, set up to operate the clutch and a brake or front & rear brakes. We also offer a unique system that enables you to change up and down the gears once on the move without using the clutch (see Club, & Expert systems). Very useful motorcycle adaptation developed over the last 12 years. Stiff or heavy clutch operation ? or virtually unable to use the clutch ?? A stiff or heavy clutch is a problem that Some motorcycle riders especially disabled riders/elderly/ arthritic riders, but a quickshifter can help enormously by alleviating the majority of clutch use required. Once you are moving there’s no need to use the clutch for upshifts or downshifts; the Flatshifter Expert system allows smooth, consistent shifting without touching the clutch lever or even easing off the throttle. Much of the resistance is removed from the foot lever as well, allowing for shifts with a gentle nudge rather than a forceful kick. please call us to discuss further. We also offer a hydraulic clutch with variable length /angled levers to make clutch operation much lighter to operate, this clutch lever matches the Dualever in design. Would Clutch-less gear changes be Helpful to you ?? The Basic mechanics of a quickshifter system are really very simple: a small device installed in the gear linkage senses pressure on the shift pedal (or gear lever), the sensor sends a signal to the ECU to cut the power to the ignition coils, allowing the bike to be essentially “Turned off” for an instant while the next gear slides into place. Quickshifters, as they are more commonly known, are very useful for motorcycle and trike riders who have problems operating a clutch lever, as well as for motorsport use, although the Expert system does not totally eliminate 100% of clutch use it does greatly reduce it, you will still need to operate the clutch as normal when selecting 1st gear and pulling away from stationary, and probably slow speed manoeuvring, other than that enjoy the freedom of the road again with virtually no clutch use. 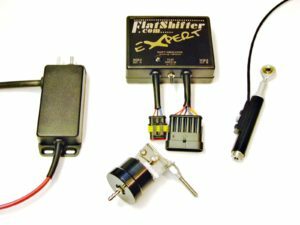 The Flatshifter Expert system will enable you to change up & down through the gears once you are moving without using the clutch. We are very happy to offer any help or advice we can, please contact us even if you have no intention of purchasing any products from us, that is not an issue, Flatshifter started out successfully producing top quality race winning quick-shifters / performance and ride-ability riders aids for motorcycle engined cars & motor sport teams, kit car manufacturers, motorcycle riders & racers for many years, and we were frequently being asked if our products would or could be adapted for Disabled Motorcycle Riders, Trike, & Kit Car owners at affordable price`s, so we have developed & modified our products were necessary to suit. Having a disability need not be the end of your motorcycle riding. Motorsport demands top quality reliable cost-effective products, These requirements are even more essential for Disabled riders & drivers or who are physically impaired in some way. All of our products include a full 12 months parts & labour warranty for your peace of mind. Electric button operated gear changing. We also sup ply electric gear shifter/selector systems using the handlebar mounted buttons, 2 different clutch-less upshift and clutch-less down gearshift systems (only available from us). The “Dualever” twin clutch / brake lever, Really easy to use !! just press the red button to change up a gear or 2 press the green button to change down through the gears, yes its that simple,if you also fit the Expert system when you press the button to change gear it will also operate the clutchless system ie button operated gearshifts without using the clutch Awesome !! Price Guarantee. If you see the same or a similar quality new product cheaper than us, let us know, and we will endeavour to provide you with an unbeatable price. Flatshifter Club Clutch-less Up gear shifts Only works on its own or with the Flatshifter Max gear selector system. Flatshifter Expert Quickshifter. Enables Clutch-less up and down gear shifts with soft power restore & works on its own or with the Flatshifter Max electric gear selector system. A stiff or heavy clutch is a problem that Some bikes have this gives problems to many riders disabled or elderly motorcycle riders, but a quick shifter can help enormously by alleviating the majority of clutch use required. Once you are moving there’s no need to use the clutch for upshifts or downshifts; the Flatshifter system allows smooth, consistent shifting without touching the clutch lever or even easing off the throttle. Much of the resistance is removed from the foot lever as well, allowing for shifts with a gentle nudge rather than a forceful kick. Electro-mechanical gear actuator system. Simple Push button control of gear changes for motorcycles, Trikes, & bike engined cars. Who wouldn’t like a button to control everything? Motorcycle adaptions- Dualever / k-lever. Motorcycle or trike, twin clutch/brake lever & master cylinders. Left or right handlebar mounting use the dual lever system to operate the clutch or brake or front and rear brakes with one hand ! !